Replied by mumi on topic Amerika'nin Politikasi Yabanci Hekimlere Karsi Degisir mi? Replied by rabinovich2006 on topic Amerika'nin Politikasi Yabanci Hekimlere Karsi Degisir mi? Yooo enrolled diyor, mezun demiyor.. Jama makalesinin ikinci paragrafi diyorsun dimi? Bence JAMA'daki yazi daha az iddali ve daha gercekci ve yorumlari okuyucuya birakiyor. MEDICALOPEDIA'daki sanki biraz bizim moralimizi bozmak icin yazilmis.. Ama diger arkadaslarin bu konuda fikirlerini merak ediyorum tabi... Ulas abi? Deniz? 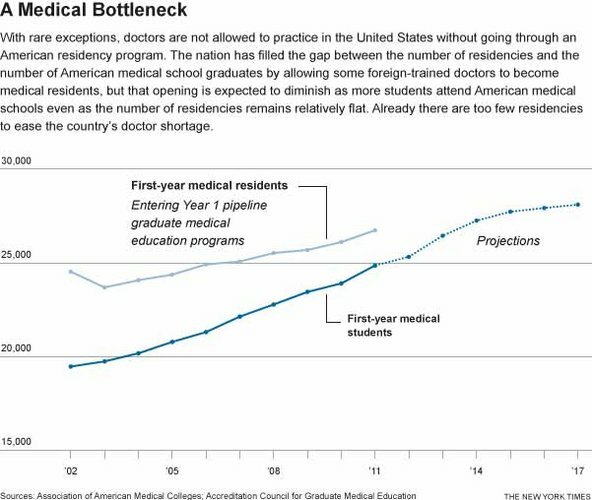 By 2015, the number of graduates from US medical schools is anticipated to surpass the number of positions in residency programs.1 Because the vast majority of US medical school graduates will choose to remain in the United States, and most residency programs will continue to give preference to US graduates, the number of international medical graduates (IMGs) who train in the United States is expected to decrease (Figure). Although many may see this as a positive development (US programs have been accused of exacerbating the “brain drain” from developing countries), this decrease may have additional unanticipated consequences for the diversity and activities of physicians practicing in the United States—a shift that could begin to affect patient care. Approximately one-quarter of all physicians currently practicing in the United States and 10% to 15% of trainees in residency programs are IMGs.2,3 A forecasted physician shortage has led to expansion of enrollment in existing US medical schools and establishment of new ones (both allopathic and osteopathic), with 19 230 first-year students enrolled in 2011; the number of students graduating from US medical schools is therefore increasing quickly (projected to reach 26 709 enrolled per year by 2016-2017, a 37% increase relative to 2002-2003).4 However, the number of training positions in US residency programs has not similarly expanded and, indeed, may contract as a consequence of decreases in graduate medical education funding. In 2011 there were 26 386 postgraduate year 1 positions in Accreditation Council for Graduate Medical Education–accredited programs (growth rate from 2001-2010, 0.883% per year).1 This unbalanced increase in graduating US MDs compared with postgraduate training positions is manifesting in an increase in the number of unmatched US MD seniors.5 An increase in the number of US medical school positions may result in the admission of less-qualified students, which may ultimately have a negative effect on the quality of care offered by US graduates. International medical graduates pursue training in the United States for a variety of reasons, including the opportunity for high-quality training and for remuneration that may be more generous than could be earned in their country of origin. For some, primary care work in underserved areas can create a path to citizenship. Existing visa waiver programs allow some IMGs who complete residency training to stay and work in the United States only if they do so in medically underserved areas.2 How IMG-dependent hospitals and health care systems will adapt to the decreased availability of IMGs in the United States and whether US graduates will be willing to fill these important and challenging roles remains to be seen; failure to do so may worsen geographic disparities in access to care. Furthermore, if insurance coverage expands as anticipated under the Affordable Care Act, a primary care physician shortage may become increasingly severe if the availability of IMGs is limited. International medical graduates help provide significant diversity in the workforce. For example, they are substantially more likely to be of Asian or Pacific Islander descent than US graduates (31.6% of IMGs vs 4.9% of US graduates) as well as more likely to be of Hispanic or Latino descent (6.7% of IMGs vs 1.5% of US graduates).2,3 Care provided by clinicians of concordant ethnicity appears to improve care quality and partnership in the patient-physician relationship, so any reduction in physician diversity could further exacerbate existing disparities in health care.7 Although this may be partially offset through active minority recruitment of US medical schools, IMGs inherently offer a broader cultural, linguistic, and ethnic diversity. The reduction in training positions for IMGs will also be of concern to countries that have benefitted from returning clinicians who have been trained in the United States. Many IMGs who immigrate for medical training intend their stay in the United States to be temporary and return to practice in their home countries.2 Because access to medical training in Europe and Australia is increasingly being limited to local citizens, a reduction in US training positions could meaningfully reduce the access of medical graduates from underserved nations to the high-quality and efficient training that is generally available in the United States and, hence, their capacity to provide high-quality care in their home countries. The risks implied by the workforce changes described, particularly in the context of expected modifications to the US health care system in the near future, could be mitigated by concerted action. Additional funding to facilitate growth in residency programs to more closely reflect the increasing number of US medical school graduates may abate the risks. Since funding sources for training are already strained and anticipated to tighten further, creative solutions have to be considered. Other strategies could include efforts to make primary care in rural settings more attractive to US graduates, additional recruitment and retention strategies to augment the representation of minorities in US medical schools, expansion of nonphysician clinicians, or self-financing of postgraduate training. Additionally, IMGs could be recruited to meet the primary care shortfall if funding or other incentives were made available, such as retention of the programs that create a path to citizenship for clinicians who dedicate several years to providing primary care to underserved populations. The rapidly increasing number of medical school graduates coupled with a constrained graduate medical education system is likely to have a substantial effect on the number of IMG recruits to US programs. 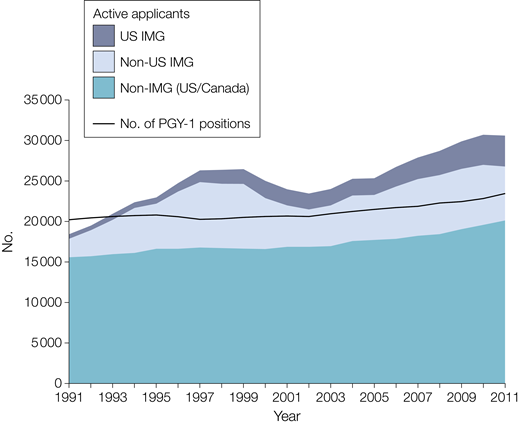 These trends threaten to reduce the diversity of the physician community and could meaningfully affect primary care delivery in the United States and even health care quality abroad.10 Despite the proven value of IMGs to the US health care system, coming to America is likely to prove increasingly challenging for future IMGs. Replied by neox on topic Amerika'nin Politikasi Yabanci Hekimlere Karsi Degisir mi? yalnız arkadaşlar sanki açık devam edecekmiş gibi bir algı oluştu bende, yanlış anlamadıysam us mezunu kişilerin sayısı residency kontanjanını 2015 te geçecekmiş ama öte yandan artan nüfus ve obama care nedeniyle doktor açığı önümüzdeki yıllarda devam edecekmiş gibi algıladım ben. yanlış mı algıladım acaba? öte yandan ny times üç aşağı beş yukarı bildiğimiz şeyleri yazmış ve güvenilir bir kaynak ama diğer kaynaklar mesela medicalopedia acaba güvenilir midir? Replied by drbrosk on topic Amerika'nin Politikasi Yabanci Hekimlere Karsi Degisir mi? Replied by umc on topic Amerika'nin Politikasi Yabanci Hekimlere Karsi Degisir mi? Yazı ilginç, istatistikler düşündürücü, ABD'de yabancı doktorların varlığının ihtiyaca bağlı olduğu bir gerçek ve bu temel gerçek eğer değişirse bir çok şey de mutlaka değişecektir. Bakalım hep birlikte göreceğiz. Amerikadaki tip okullarinda mezun sayisi ve uzmanlikta alabilecek kontejan sayisi arasinda bir bosluk oldugunu ve bu boslugu Amerikanin bir sekilde doldurlumasi geriktigi bilirtiyor. Bunun icin yavas yavas tip fakultelerinden mezun sayilarini artirabilir diger taraftan yurt disindan ogrenci alinabilir. 2015 yilinda mezunlar sayisi ve uzmalik kontenjan sayisi arasinda cok kucuk bir bosluk olacak (ya da esit olacak...)... buradan soyle bir sonuc cikartabilirizs: bence 2015ten sonra artik yabancilarin uzmanliga girebilmek icin kendi aralarinda degil amerikadaki mezunlariyla da yarisa girmek zorunda olacagini soylebiliriz. Daha sonra ECFMG, usmle,vs sikintilarindan basediyor. Amerikanin ihtiyaci oldugu halde, yurt disindan gelmis, ve orada yillardir anestezioloji (ya da baska bir brans) yapan bir insanin oniunnde NEDEN bir suru engel konuluyor? yani insan neden tekrar uzmanlik okumak zorunda... Bununla ilgli birkac ornek veriliyor, ve yurt disindan gelmis doktorar, evrak ve usmle isleri surerken lokantalarda falan calismak zorunda kaliyor..
Yani dusunduren bir yazi.... yorumlari da okumanizi tavsiye ederim.. ILGINC! Replied by Sydrsydr on topic Amerika'nin Politikasi Yabanci Hekimlere Karsi Degisir mi? Yukaridaki linkte cok guzel bir yazi var. Oncelikle yorumlarinizi cok merak ediyorum. Birsey degismesi cok zor, cunku Amerika'da tip okullari cok pahali ve bu bir pazara, cok buyuk para kazandiran bir pyasaya donustu. ABD disinda tip egtimini tamamlayan doktorlari kolaylikla(USMLE, ECFMG, residency vs vs olmadam) kabul ederlerse, amerikalilar bile yurt disinda okuyup kendi ulkelerine donecekler, ve amerikada tip okumak ve bunun icin buyuk para vermeye gerek kalmaz, bu da ayni zamanda universitelerin buyuk kazanc kaybina yol acar. Yazida ayrica diger/fakir ulkelerden bir cok doktorun gelmesinden bahsedildi, o da onemli bir faktor tabi. Benin ingilizcem şuan yeterli düzeyde değil, yazı neden bahsediyor? Bizim açımızdan olumlu mu olumsuz mu? Diş hekimliğinin prosedürü farklı diye hatırlıyorum, ECFMG değil de başka bir yolu var sanki, yanlış aklıma kalmadıysa. Ya arkadaslar soyle bir sorum var yukaridaki yazida da bahsedildi.. Amerika yurtdisinda dis hekimligini bitiren diplomalarini kabul etmiyor mu ya? Cok sasirdim. Bu konuyu arastirdim biraz, eyalete gire degisirmis ama cogu amerikan ya da canada diplomasini istiyor ve yurt disinda bitirenler dis hekimleri kabul eden bir eyalet te bulamadim acikcasi. Yani turkiyede dis hekimligini bitirip amerikada uzmanliga giremiyor mu dis hekimler? ?